Mixtroz is a Birmingham, Alabama-based startup that has raised more than $1 million to further build up its networking software platform, which connects people at live events in real-time. 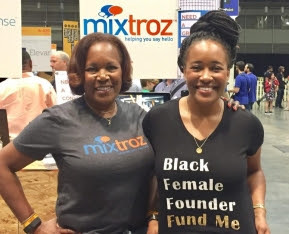 Mixtroz is considered one of the first minority and woman-owned startups to raise over $1 million. The founding mother-daughter team of Mixtroz is Kerry Schrader and Ashlee Ammons. They are among only 40 black females to close $1 million in seed funding. Schrader and Ammons founded Mixtroz in Nashville, Tennessee in 2015 and then relocated its headquarters to headquarters to Birmingham, Alabama. Mixtroz’s networking software can be used at events where 25 or more people are attending. By driving attendees to go from phone to face-to-face meetings, it sparks dynamic conversations. And the event hosts gain valuable data on those interactions. Earlier this year, Mixtroz pitched to a panel of judges including AOL co-founder and Revolution CEO Steve Case as part of “Revolution’s Rise of the Rest” tour. Following this pitch, Mixtroz secured a $100,000 investment from Revolution’s Rise of the Rest Seed Fund. Mixtroz enables organizers and sponsors to tailor specific questions in order to capture data from event attendees. This reduces the need to set up “icebreaker” games as a way to create matches for the attendees. “The fact that we were able to acquire prestigious clients clearly shows that there is a real need for our product. People attend events to make valuable connections. In the digital age, if the main motivation was to consume content, we’d all just livestream at home. Mixtroz is a way to make the most of your time when you have decided to make the effort to leave the house and attend an event,” added Ammons — who is COO of Mixtroz and was the first intern to NBA star LeBron James.